Radiation sterilized. Petri dishes are considered sterile if sleeve is not opened or damaged. Optically clear. Clear top and bottom viewing surfaces. 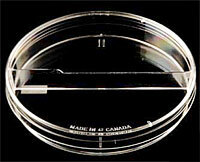 * Stock # 5020-05 (Stabilization Ring Style) - Stabilization ring in base ensures even media depth for susceptibility test. For use in automated filling equipment. *** Stock # 5020-06 (Bi-Plate Style) - Two marked compartments for easy identification. Designed for simultaneous studies of organisms in a common environment. Raised partition for automation equipment. **** Stock # 5020-07, 5020-08 (Deep Style) - deep dish petri dishes for increased media volume, which allows longer culture periods. Petri Dish #5020-08 is ideal for seed germination testing. Choose from several sizes of disposable sterile stackable or slippable clear polystyrene petri dishes. The petri dishes with slippable lids are ideal for use in automated equipment. Manufactured from virgin grade polystyrene, these sterile petri dishes have optimum clarity. Ventilation ribs allow for free air circulation and reduce condensation during incubation. These petri dishes are radiation sterilized.